Donald Trump is president, the Cubs won the World Series and Cornelius Ortiz is no longer the chief villain on Project Runway. The world is a crazy place, and if there’s one constant, it’s Erin Robertson’s long coats, which she constructs week after week with diminishing returns. Robertson is no longer the show’s darling, and clearly, she’s not handling the continued critiques well. Her work on tonight’s episode was one of the biggest disappointments yet, and just another in a surprisingly long line of letdowns. This is all proof that she deserved the ax last week and not Cornelius Ortiz (who was mercifully saved). This week’s challenge was the cutest of the season because it involved the contestants’ loved ones. Designing for finicky family members can be a challenge, but the contestants did their best. Robertson decided that her mom could use her signature long coat, which has proven successful on the runway on multiple occasions. At some level, it makes sense to stick with your talent, but the judges don’t look kindly on repetitiveness. Now, if Robertson had produced a stellar look, the judges probably could have overlooked the whole one-trick pony thing. Unfortunately, her design just didn’t work on the runway. She combined the usual coat with a summery dress — a concept that took her ages to explain. The judges were not impressed by Robertson’s concept. Before it even hit the runway, Tim Gunn said it felt too immature. The other judges regarded the look as a winter coat over a summer dress. This mixing of the seasons just didn’t work. Any other week, Robertson probably would have been sent home, but she really lucked out this time. Jenni Riccetti struggled with a super-indecisive subject, making it difficult for her to get started. Her mother’s mixed messages ultimately resulted in a look even more disjointed than Robertson’s. Riccetti’s runway look was all wrong, but at least she tried something different. Robertson has coasted on her coats and embroidery week after week, and it’s getting old. She needs to step it up, or she’ll be the next designer sent packing. 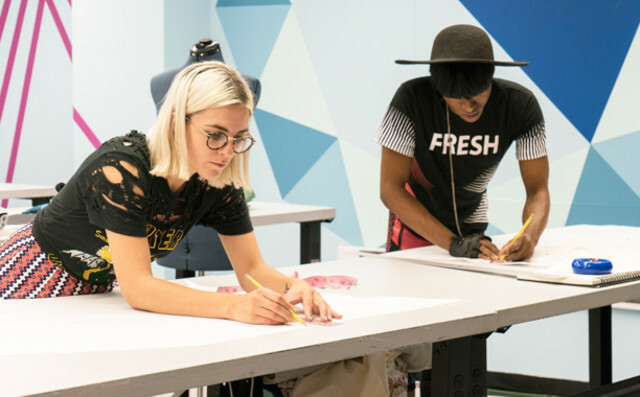 Are you sick of Erin Robertson’s coats on Project Runway? Comment and share your opinion below.